Overall I have been quite pleased with Google Messenger. 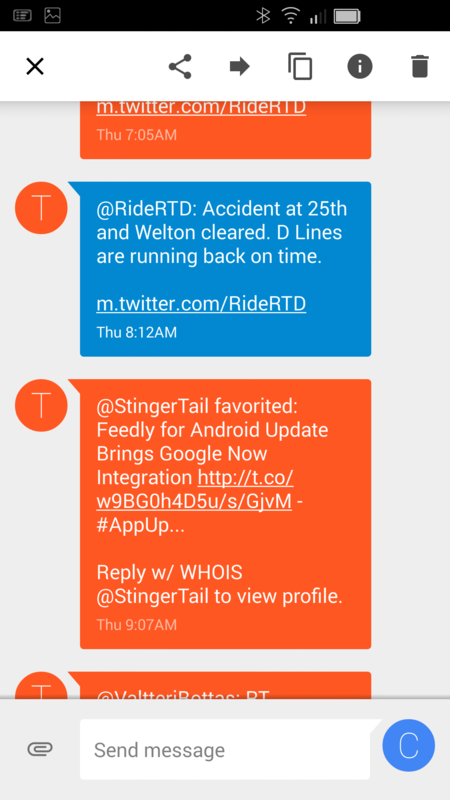 It is solid, easy-to-use messaging app that integrates nicely into my Android experience. It has a nice set of features and functionality which, while they could be improved in some areas, generally are better than most built-in messaging apps. I appreciate that this app isn’t the most sophisticated out there and certainly isn’t going to win a feature bake-off but if you need a simple, clean looking messaging app, give Google Messenger a try. While every Android phone will come with a SMS app, there are plenty of alternative apps available in the Google Play Store. One of those is from Google themselves, the Google Messenger app. It is a solid alternative to native text apps, giving you both SMS and MMS capability in a clean, simple UI that is quite colorful at the same time. I’ve been using the app for a couple of weeks now on my BLU VIVO IV phone and after trying several others, it has become my default texting app. Here are my thoughts and review of the app which is free in the store. names of text conversation contacts from your contacts on your phone. To start a text conversation with someone, just tap the big Plus Sign icon in the lower right corner then enter in the name of your contact or a phone number to who you are sending the message to in the app. Type your message then press the Send arrow icon to send the message to them. If you want to send a multimedia message (MMS) then attach the file or photo to your message with the paperclip icon next to the text box at the bottom of the new message screen. None of this is really any different than any other SMS app but Google Messenger’s simple interface makes it intuitive the moment you start using the app. Your list of messages in Google Messenger are organized by the newest message at the top of the user interface. If the number is associated with a contact, you will see that contacts name (not their number) and if you have a photo associated with them it will show that as well. Otherwise it shows the first letter of their first name. 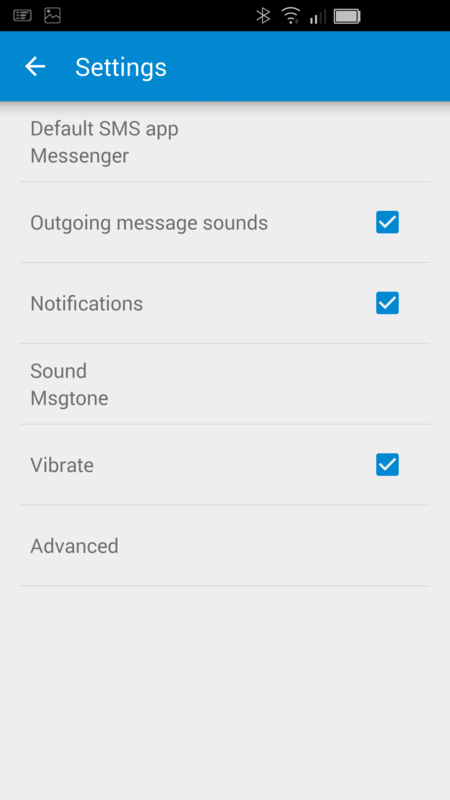 When you receive a new message you will get a notification (if enabled) and that new message will be in bold. and-hold a part of the message and it will bring up the editing options as a menu bar at the top of the display. Here you can that part of the message with whatever apps you have installed that allow sharing to them (email, Facebook, etc). You can also forward that portion of the message as well as copy it so you can paste it into another email or file. As you would expect, you can also delete that part of the message. 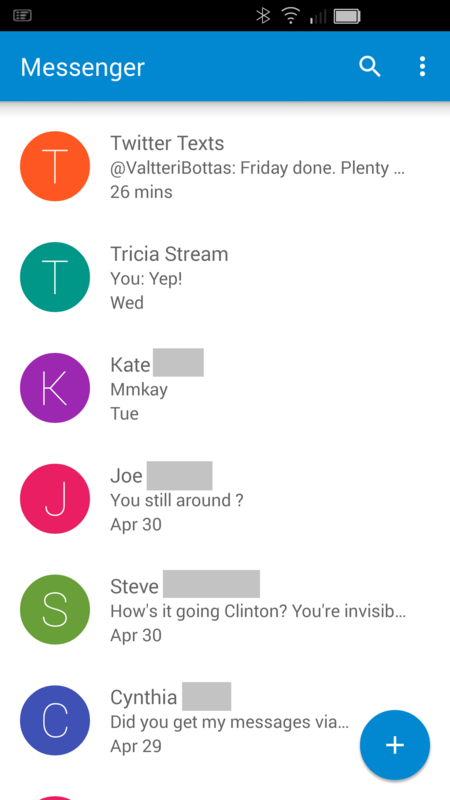 While we are on the subject of tap-and-hold, if you are on the main display of Google Messenger and want to archive, delete, cancel any notifications for that particular sender or delete a thread, you can tap-and-hold on the message list to pop up that menu at the top of the display. If there is one area that I would like to see improved in Google Messenger it would be around some of these editing tools. The biggest issue I have with it is that you can only select on portion of a message at a time. That means if you want to forward an entire message, you will be faced with multiple tap-and-holds then sharing each part of the message. Frankly I don’t do this often but I know some who do and it could be a bit of a process for them. replies). You can also set your roaming rules and SMS delivery reports should you want them. Google Messenger is a free app in the Google Play Store. I also love Google messenger butone thing I can not figure out is why the native messenger still stores all of the texts. And the only way I have figured out how to delete them from there is to make it the default text app and then delete the old texts. Doesn’t this use up space on the phone if they dont automatically delete from there? It does eat up a little bit of space yes. I have the same thing happen on my OnePlus One. I’m assuming it is how Android at the app level works.